In the same family as Himalayan Balsam, but has larger but fewer flowers in the panicle. Stems often red, thin but stiff with heart-shaped leaves at the base of a flowering branch. Grows to 60cm. Thrum flowers. Flowers white to pinkish with five tepals, larger and more open than other members of the Knotweed and Dock Family such as Knotweeds themselves, or Bistorts or Knotgrasses. Stalkless leaves clasp the stem. Shape varies from heart-shaped near the top, to arrowhead near the bottom of the plant, which is up to 3 feet tall. Sheaths at the base of the leaf stems are not fringed as they are on some similar plants from the Knotweed Family. 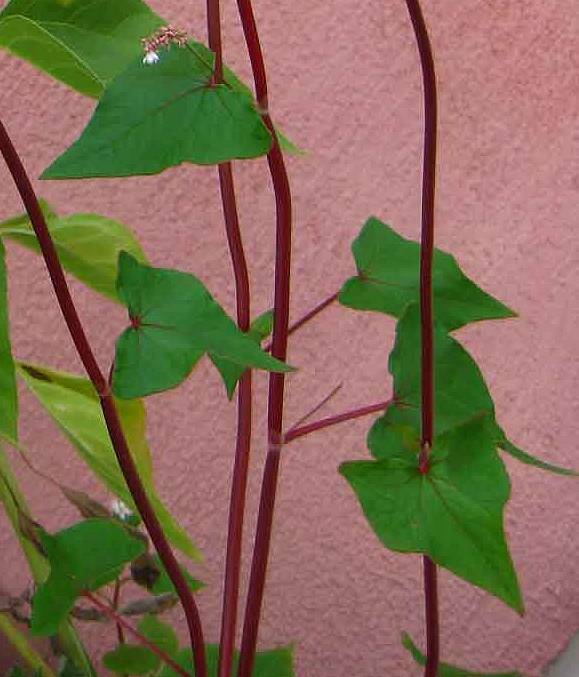 Some similarities to : Knotweeds and the leaves are similar to some Bindweed s but it is not a climbing plant. No relation to : Wheat , Common Cow-wheat, Crested Cow-wheat , Field Cow-Wheat, Buckthorn, Sea-Buckthorn, Buck's-horn Plantain or Buck's-Beard. [plants with similar names belonging to differing families]. An annual. Occurs casually, anywhere at any time, but not lingering for long in any one place. Occurs especially where once grown as a food for game-birds. A flour called Buckwheat flour can be made, and is used to make noodles in Japan, although Buckwheat can cause allergic reactions in sensitive people, which can result in death in severe cases. A century ago Russia was a world leader in Buckwheat grown for Buckwheat flour, hence the name Buckwheat. The worlds largest crop grower of Buckwheat is now China. A herbal tea can be prepared from Buckwheat. 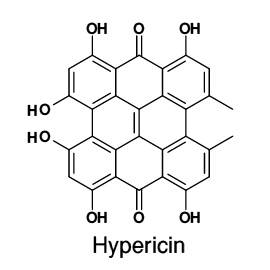 Hypericin is a red-coloured anthraquinone-derivative and one of the naphthodianthrones. 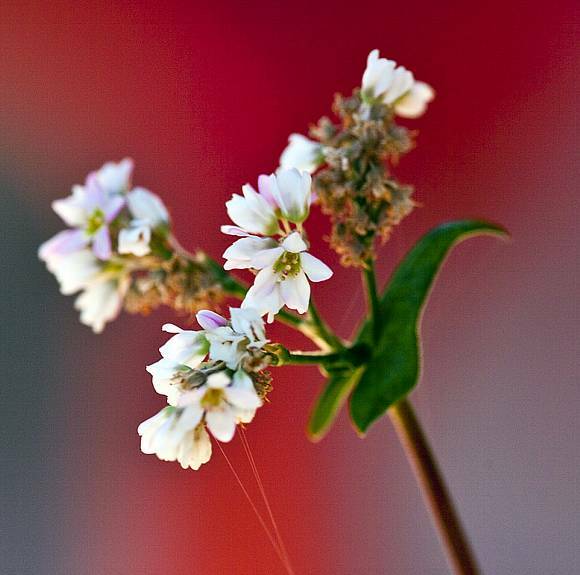 It is not, as far as is known, present in Buckwheat, but is shown alongside to show the relationship between the two. As can be seen, Hypericin is a dimer of an anthraquinone derivative. 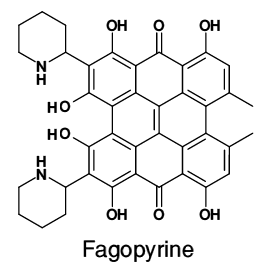 Fagopyrine is a red-fluorescing red pigment found within Buckwheat and is a double piperidine of Hypericin. Containing nitrogen, Fagopyrine is an alkaloid whereas Hypericin is not. Fagopyrine, named after the scientific name for Buckwheat, is present in both the flowers and the seed husks of Buckwheat, and if considerable quantities are consumed by humans or animals can induce dermatitis when the skin is exposed to sunlight (even from high powered artificial lighting), a condition known as Fagopyrism. It is thus a photo-sensitizer which exhibits photo-toxicity. Fagopyrism in sheep and pigs can also induce nausea and cramp as well as photo-sensitization of the skin. 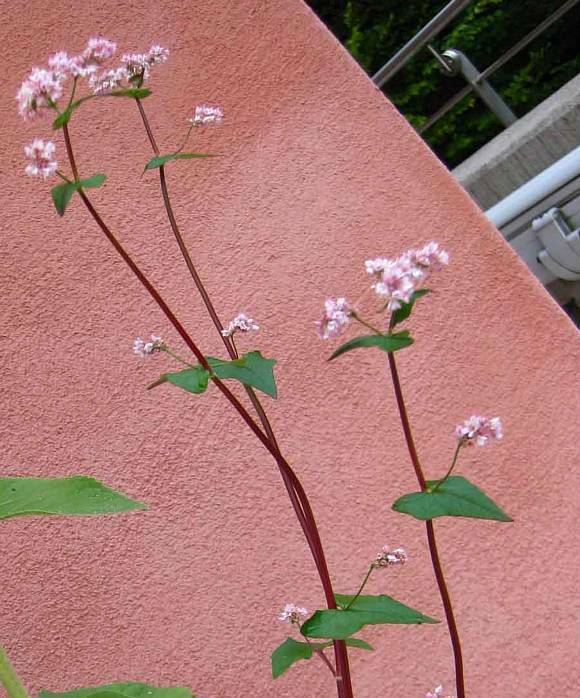 Ingestion or inhalation of parts of the plant by humans (such as Buckwheat flour or noodles made from the flour) can induce an allergic reaction. 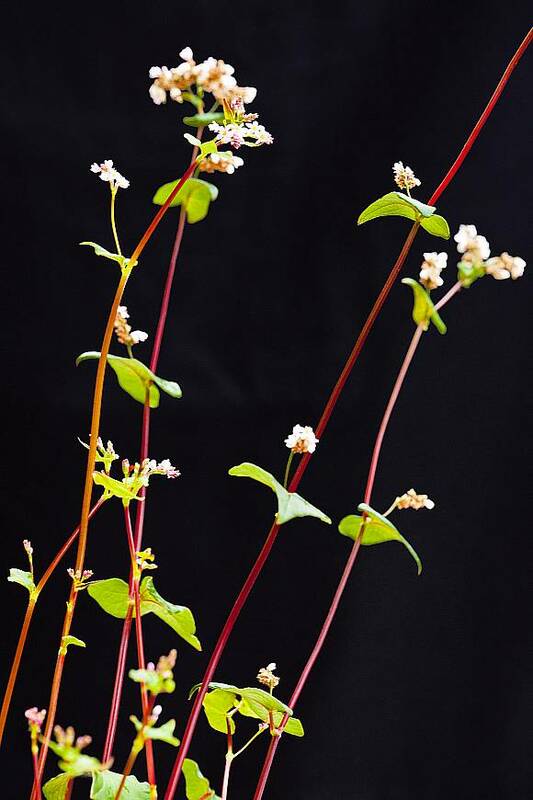 Both red and brown dyes can be extracted from Buckwheat. It is Heterostylous, where the flowers, although bisexual, come in two types, thrum and pin. The pin form has a long style and short stamens, the thrum form is the reverse of that.